The other day, I mentioned I was playing around with Chicken Scratch embroidery, or “gingham lace” embroidery. The fun thing about embroidery on gingham is that it works up pretty quickly, and with just a few subtle changes, you can have a completely different looking design. Today, I’ll share a pattern with you and chat about supplies I’m using. The fabric I used on the earlier chicken scratch sample is a coral-pink gingham, in 1/8″ checks. It’s 100% cotton, and it’s a nice fabric, though quite light. For the little table mat I’m hoping to put together before Easter (! ), I will line it with white fabric. By the way, I love that it’s very easy to tear the gingham along the grain to get a good, straight edge, rather than having to cut it. I purchased it at Farmhouse Fabrics. Especially if you make children’s clothes, it’s a great place to find fabric. In selecting threads to use for chicken scratch embroidery, you need to keep in mind the size of the checks on the fabric, and choose your threads accordingly. Very fine threads don’t work so well on large checks. Very heavy threads don’t work at all on tiny checks. It might take a little trial and error to figure out which threads will work best for the fabric you’re using. White foundation stitches (double cross stitches): coton a broder #20 or #25 (I used 20, but both work). Yellow & Purple (flowers): coton a broder 25: I used one strand in yellow for the double cross stitch for the center of the flowers. In the sample directly above, I used two strands for the petals. In the previous sample (which matches the pattern in the PDF below), I used two strands of purple for the long petals on the flower and one strand for the short petals in between. Leaves – one strand of floche in bright green. Threaded Blocks & Scalloped Outlines: coton a broder #16, although you can use 20, and it still works. I found the heavier #16 really makes the white stand out. 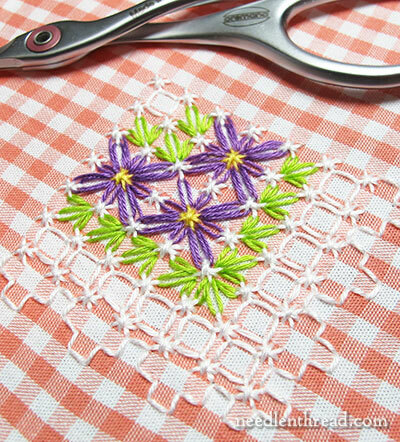 I find that the foundation stitches or holding stitches (the double cross stitches, cross stitches, upright cross stitches and straight stitches behind which other threads pass to create designs) are better off when worked in a non-strandable thread, like coton a broder in the various sizes, or perle cotton. If you work the foundation threads with regular stranded cotton, it’s very easy to catch parts of them while passing underneath them. The red dashed lines in the pattern indicate where you can repeat the design indefinitely, until you want to finish the edge. You can make any adjustments you want in the pattern as you go to suite yourself. It’s been a lot of fun playing around with gingham lace samples, and if I drum up more patterns, I’ll share them with you, along with some tips for those who have never tried scratching chickens. 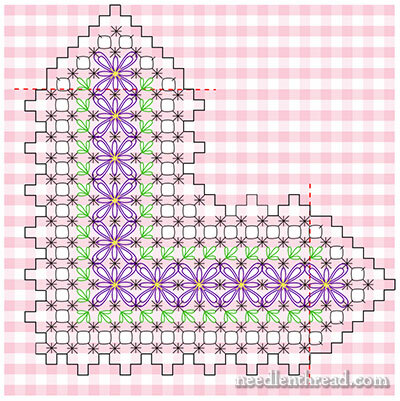 The pattern is lovely a nice Easter design and it looks fun to stitch. I’ve not tried gingham stitching before it looks quite easy to embroider and cotton a border is a nice thread to use. Thanks for sharing the pattern and the instructions on how to embroider it with us. Mary, I am new to your Newsletter. Now I eagerly await each day’s post. I have also been dipping into your Tips and Techniques. Can’t tell you how much I am enjoying this injection of awesomeness into my life. Thank you. Thank you. Thank you. Hi, Clare! I’m so glad you’re enjoying Needle ‘n Thread! Thanks for your enthusiasm! Happy belated Birthday for last week! Chicken scratch embroidery looks like fun. I love your use of colour! 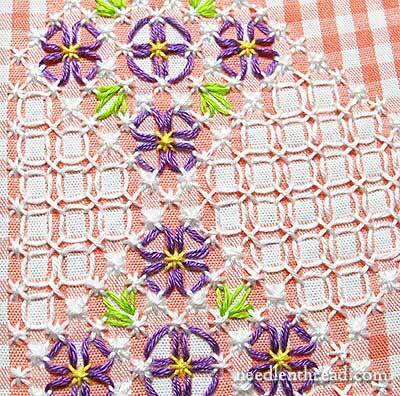 My Mum used to embroider white on gingham for table clothes that were used everyday. More recently, I saw a display by our local Embroiders’ Guild and was very impressed by how sophisticated this simple style could be made to look. I would love to give it a go with some basic instructions. Thank you Mary! thanks so much, one of these days I have to get around to some chicken scratch!! Muito lindo seu trabalho, adoro fazer esse bordado. Vou adorar ver outros. Mary , Farmhouse didn’t have ⅛ inch gingham when I searched there. It is a lovely website . Thanks for the free pattern . I am so happy to see this site with lovely patterns of Chicken Scratch/Ginghamm Embroidery. Only thing I am a beginner. I learn things by logging on to various of embroidery websites and look for relevant video clips and practice by watching at it. I was able to copy one of your patterns in this page. But yet I do not know some of the techniques how to sew. If their is a web site of yours where I could watch how you sew, so that i can get an idea how to work on it. Looking forward to hear a favorable reply from you at your earliest through my mail. Thank you and May God Bless you. Hi Mary, I have looked all over the instructions for the above embroidery and I don’t find any on how the outside part is done. In the picture, It looks like huck embroidery. If it is like that, do you try to go under just one thread? You can also work it as running stitch, skipping every other stitch forward, and then return along the pattern, and stitch the stitches in between. That would use less thread and keep the back neater. I am new to your news letter.i have also been dipping into your tips & techiniques. The pattern is lovely & nice and it looks interest to stich I am really thankful to you because I am tired of searching new desins for my new house decorations. Thank you, thank you. Dear Mary, your patterns are beautiful!!! I have a questions for you, I hope in your precious response! I am looking for a program to create chicken scratch embroidery pattern, can you help me?? thank you! Hi, Mary – I’m not familiar with any pattern books for chicken scratch. I have a few free patterns here on the website, though, like the one above.